With a projected $225 million being spent to create a "purpose-built" spaceport near Upham, New Mexico--expected to be completed by 2009-2010--for many of the principals involved there remains but one question: what is a 21st century spaceport supposed to look like? Bulldozers have yet to start pushing dirt around. 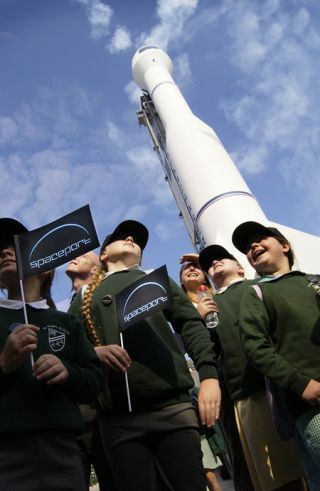 Nonetheless, near-term and future users of the spaceport are ready to bring their respective countdowns into the area. Late last year, British entrepreneur, Richard Branson, decided to park the world headquarters of his Virgin Galactic spaceline in New Mexico and to use the Southwest Regional Spaceport as the company's primary operating base. Furthermore, the state's quest to build a spaceport has also become a magnet for rocket builders Starchaser Industries, launch specialists UP Aerospace, the annual X Prize Cup and the Rocket Racing League. New Mexico spaceport advocates also envision the project as one of "national significance"--capable of supporting NASA and other U.S. government agencies too. International space agencies can contract with the private sector to loft passengers and payloads from the spaceport to the International Space Station and to the Moon. The proposed spaceport site is approximately 27 square miles of open, generally level, range land that can be found 45 miles north of Las Cruces and 30 miles east of Truth or Consequences. This site was picked for its low population density, uncongested airspace, and high elevation. That's ideal rocket country for UP Aerospace of Unionville, Connecticut. They are readying their SpaceLoft XL rocket for a New Mexico spaceport sendoff in late March. This opening rocket launch is to set the stage for a series of space liftoffs planned for the Southwest Regional Spaceport. The UP Aerospace launch facility involves use of a large concrete pad holding a hydraulically controlled, custom-built rocket rail that's painted pristine white "and will be a visually stunning structure at the spaceport," said Eric Knight, the group's Chief Executive Officer. Other on-site temporary structures that are to be utilized include a Launch Control Center, a Payload Assembly and Integration building, a mobile Rocket Assembly and Integration facility that moves on top of the concrete launch pad, and a high-tech Doppler sonic detection and ranging weather station. "Miles of roads are also being enhanced to support the operations of the new space launch facility," Knight added. "We're just about complete with the manufacturing of our SpaceLoft XL vehicle for the spaceport's inaugural space mission," Knight said. "Our partnership with New Mexico goes well beyond launching rockets," Knight pointed out. The UP Aerospace agreement with New Mexico includes providing data about their rocket flights to assist the spaceport in acquiring its Federal Aviation Administration (FAA) license. The upcoming flight in March is sold out. That is, commercial and educational sectors represent 11 customer payloads set to fly onboard the suborbital rocket. "We're booking payloads and experiments on another two flights this year...and multiple flights in 2007. We're on track to ramp up to 30 space launches per year by 2008," Knight advised SPACE.com. The SpaceLoft XL will zoom to some 70 miles (113 kilometers) altitude. As the rocket returns from space it separates into two elements -- an upper nosecone-payload section and a lower rocket-booster section -- both of which are recovered by parachutes down range. The entire flight, from launch to touchdown, takes about 15 minutes, Knight said. Starchaser Industries Inc. set up business in New Mexico over a year ago, qualifying it as the first private space firm to locate to the region. The group's U.S. operations are being run from offices in Las Cruces. "We are very pleased to be here" said Steve Bennett, Chief Executive Officer for Starchaser Industries. "The 4,000 foot elevation, great weather and close proximity to the restricted airspace controlled by the White Sands Missile Range make for an ideal launch area," he told SPACE.com. Starchaser has taken on their first local employees, Bennett added, hiring in the fields of management, educational outreach and sales. They are now on the lookout for people to fill various engineering slots. The rocket company is also evaluating land options in Southern New Mexico with a view to building a research and development and launch vehicle manufacturing plant, he said. Starchaser Industries is busy at work on two major engineering efforts, dubbed Skybolt and Thunderstar. Skybolt is a low-cost reusable liquid propellant sounding rocket. Its liquid oxygen/kerosene propulsion system is designated STORM and will be test fired in March from a military establishment in Northern England prior to all up, full duration static firings that will take place in New Mexico. Skybolt is to launch reentry bodies to gain data for the Thunderstar project. It is also on tap to fly a number of related systems in support of Starchaser's overall space tourism initiative. The first Skybolt rocket is scheduled for launch out of the New Mexico spaceport in early 2007. Bennett said the relatively low acceleration of the Skybolt system makes it ideal for lofting delicate payloads, like crystal growth experiments, that could not normally be flown on a traditional sounding rocket. The Thunderstar rocket, Bennett explained, will be tasked to launch tourists into space along a ballistic trajectory. A fleet of four Thunderstar-class vehicles are to be built, each having a seating capacity for two crewmembers and up to six fare-paying passengers. Flights will be priced at around $160,000 and could commence as early as 2008, Bennett said. While it's obvious that picking the place to plant a spaceport in New Mexico is a matter of location, location, location...it's also an issue of first things first. And that means money, money, money. Last week, New Mexico Governor Bill Richardson presented his State of the State address to New Mexicans. Richardson spotlighted the still-to-be-okayed spaceport to his fellow lawmakers: "We will continue to build strong economic momentum--like the cutting-edge agreement the State negotiated with Virgin Galactic to build the world's first spaceport for commercial space flight." The spaceport is a promising endeavor for New Mexico, Richardson reported, with a projected long-term economic impact of $752 million dollars and nearly 5,800 jobs. That aside, future projections are one thing...up front money is another. "All of our effort right now is focused on securing the funding to build the spaceport," said New Mexico Economic Development Secretary Rick Homans, also Chairman of the New Mexico Spaceport Authority. "Starchaser, UP Aerospace, Virgin Galactic, Rocket Racing...won't be able to do business in New Mexico unless we have a spaceport," he told SPACE.com. Homans said that New Mexico legislators are coming to grips with the investment of $225 million for New Mexico's commercial spaceport. A legislative session is now underway, one that could shake loose $135 million of state money to kick-start spaceport construction. Given that funding, a request for proposals would be issued for spaceport architecture and engineering services by the end of February or early March, Homans said. In early July the selected firm would be under contract, he said, and they would develop the construction bid to be issued first quarter of 2007. "That would coincide perfectly with the timing of our license review and approval by the FAA. If all goes well, we hope to have that process completed by the end of 2006," Homans said. "We can't do anything permanent and begin any spaceport construction until we've completed our environmental impact statement...which leads to the issuance of the license from the FAA." The idea of a New Mexico spaceport was first proposed 15 years ago. Thanks to breakthroughs in technology, space travel is much more affordable and space is all the more accessible, Homans said. "What we've been doing is waiting for the industry. And that industry arrived on our watch." The basic infrastructure of a spaceport is fairly conventional, Homans said. Roads, water, power, as well as runways and vertical launch facilities. Spaceports already dot the world, from Russia, China, French Guiana to several such facilities here in the United States. "It doesn't seem to me that the infrastructure of the spaceport is what is revolutionary and different," Homans advised. "It's the vehicles that fly from the spaceport that will be revolutionary and different." Still, there are some practical issues ahead. "We need to build enough to accommodate the industry that is there now...and to stay a little bit ahead of it," Homans noted. The key is not to blueprint some grandiose vision trying to second-guess technology breakthroughs, he said. The spaceport must be designed and built to be easily expandable and responsive to the industry as it emerges, Homans added. "That's the challenge, I think. Not to get carried away from the beginning." For example, Virgin Galactic's suborbital passenger operations will make use of a super-huge version of the Scaled Composites White Knight carrier craft. That aircraft design was fabricated to tote the SpaceShipOne rocket plane up to release altitude for its trio of record-setting suborbital hops. At the New Mexico spaceport, a lengthy and wide runway with a certain amount of reinforcement and strength to it will be required to handle White Knight 2 suborbital runs conducted by Virgin Galactic. Looking into the future of New Mexico's spaceport--out five to ten years--air-launches of Earth-orbit bound spaceships would call for a beefed up runway. "We don't want to go back and rip up runway. We want to adapt it to the new technology," Homans said. Patti Grace Smith, the FAA's Associate Administrator for Commercial Space Transportation said time will tell how distinctive New Mexico's spaceport proves to be. "In a number of ways, it's already unique. It clearly has the governor's full support. The legislature is engaged. Other prominent leaders have spoken well of it. Community interest is high, and it has gained national, even international, attention," Smith told SPACE.com. Something this new will continue to generate plenty of discussion. It's exciting," Smith explained. "Projects involving so many people and issues will face questions...nothing wrong with questions. That's why people want to go into space in the first place, in search of answers for science, for service, and for themselves."